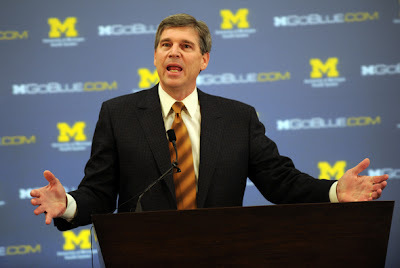 ANN ARBOR -- University of Michigan Athletic Director Dave Brandon announced today (Jan. 5) that football coach Rich Rodriguez has been relieved of his coaching duties with the football program. Rodriguez compiled a 15-22 overall record and 6-18 mark in Big Ten play during his three seasons at Michigan (2008-10). He had an 11-11 record at Michigan Stadium, a 4-10 road record and lost his only bowl game vs. Mississippi State in the 2011 Gator Bowl. U-M was 3-9 in 2008, 5-7 in 2009 and went 7-6 this season. Rodriguez became the 18th head coach in Michigan history on Dec. 17, 2007, replacing Lloyd Carr who announced his retirement following the 2007 regular season. Brandon will immediately begin a national search for a replacement.